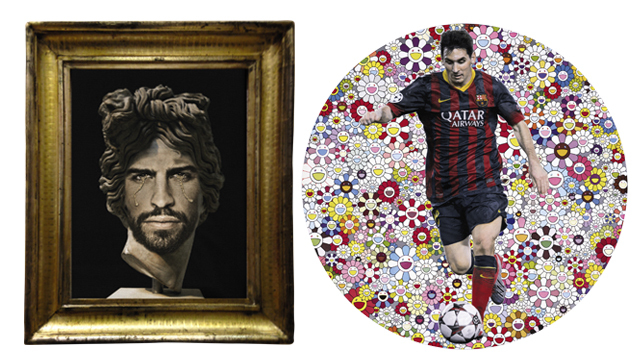 The artists were invited to either donate one of their own works to the cause, or otherwise to specially create their own works inspired by Barça, which is precisely what Takashi Murakami, Damien Hirst and Francesco Vezzoli did. Leo Messi, the image of the ‘1in11’ project, features in two of them. Japanese artist Takashi Murakami produced ‘Lionel Messi and a universe of flowers’ (2014), where the Argentinian striker appears surrounded by the Kaikai Kiki that the ‘Japanese Andy Warhol’ is so fond of. His ‘pop-manga’ style is often used in association with the Louis Vuitton brand and the starting price for the painting is expecting to be in the region of €256,000 to €384,000. Messi also appears in ‘Beautiful Messi Spin Painting for One in Eleven’ (2014) by the man considered to be the most valuable living artist, Damien Hirst. This style involves painting while turning the canvas on a gyrating platform to create highly characteristic lines. Bids for the painting are expected to start somewhere between €320,000 and €448,000. Francesco Vezzoli’s inspiration was Gerard Piqué and the classical world in the form of ‘Portrait of Gerard Pique as Apollo del Belvedere’ in which the Barça centre-back’s face is used in an image of the iconic Roman sculpture, with tears on his face, a common element in this Italian artist’s work. This one will start at between €38,400 and €51,500. As well as paintings, there also glass, furniture design and photographs by internationally renowned authors of the calibre of Cai Guo Qiang, Dia Azzawi, El Seed, Etel Adnan, Jeff Koons, Jenny Holzer, Luc Tuymans, Manal Al Dowayan, Marc Newson, Richard Serra, Shirin Neshat, Wael Shawky, Yan Pei-Ming and Yousef Ahmad. As well as the project ball (signed by Murakami and Messi), two Barça experiences will also be auctioned – offering exclusive chances to live the club to the full. The first includes a trip for two people with the first team on a Champions League away trip to watch the game from VIP seats, a shirt signed by the players and a personalised tour of the Camp Nou and Ciutat Esportiva. The second experience is the chance to watch a Champions League game from the Camp Nou VIP seats, and also includes a meeting with Leo Messi and a personalised tour of the Camp Nou and Ciutat Esportiva. To get things going ahead of the big day, world record beating football freestyler John Farnworth has appeared in a photo shoot at Sotheby’s in London, where he shows off his extraordinary skills with the ball in a series of images that depict the symbiosis between football and contemporary art.